Emma likes to draw and colour with her friends. Like all little girls, they like princesses and pretty dresses, so Elizabeth I interested them. A good way to combine their interest in fashion with history! And England has prospered since Bess became Queen. And England's grown merry since Bess became Queen. But England is England now Bess is the Queen. 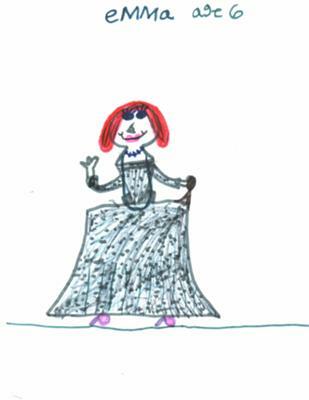 wow that's a really good drawing of queen Elizabeth I well done!!!!! this is amazing for your age! your 6 and I know a 10 year old who draws a bit like that! wow!!! awesome job on both !!!!!! !